Military and intelligence history mostly dealing with World War II. In Compromise of State Department communications in WWII I made the following correction. I had written that the M-325 SIGFOY cipher machine was introduced into service in the second half of 1944, however that was not correct. 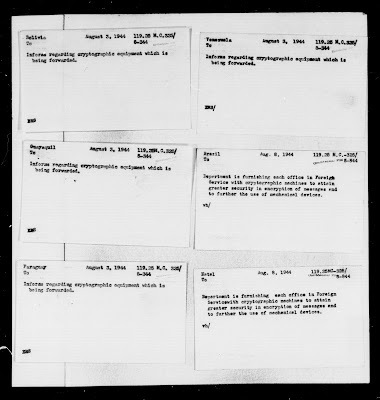 According to NARA - RG 59 - Purport Lists for the Department of State Decimal File 1910-1944 – microfilm 611 - 119.25 MC-325 the device was distributed to foreign posts in the second half of 1944 but the keylists were for the period January-June 1945. Thus the device could not have been used in 1944 by the State Department. 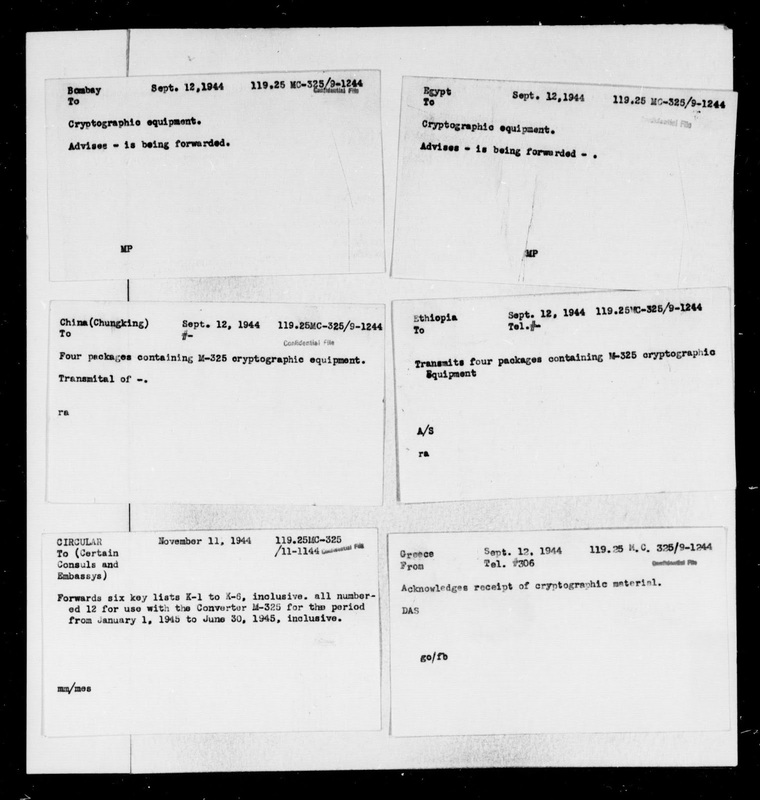 NARA has uploaded the microfilms containing entries on WWII era State Department codes and ciphers. The entries dealing with cryptology are the 119.25. Although I’ve given up on getting these files (for reasons that have already been mentioned) I will post this information in the hope that someone else will succeed. 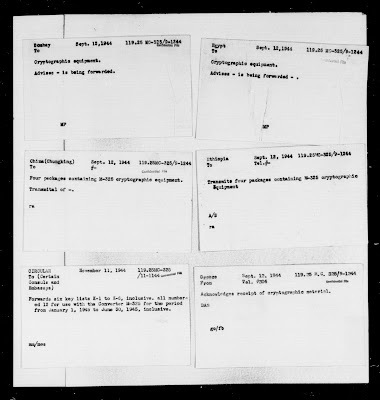 At the US national archives, in the NSA transfer group TR-0457-2016-0017, box 45, folder 3953 there is a file titled ‘KOMMANDEUR DER NACHRICHTEN AUFKLARUNG 5, 1944 (S-013,494)’. It is possible that this file contains the missing NAASt5 reports. Maybe someone can get hold of this file and solve the mystery. The International Conference on Historical Cryptology (HistoCrypt) is an annual conference on historical cryptology. The 2019 edition will be held from June 23-26, 2019 in the Mundaneum, Mons, Belgium. Submissions from those who are new to the field, particularly students, are very welcome. ‘Operation FORTITUDE SOUTH: An Analysis of its Influence upon German Dispositions and Conduct of Operations in 1944’ by Craig Bickell. 2). ‘Seeing things differently: contrasting narratives of British and German photographic intelligence during the Second World War’ by Joseph W. Caddell Jr.
I’ve always been interested in the Asia Minor campaign but unfortunately the books I’ve read so far tended to lack an in depth analysis of why the Greek forces failed to defeat the weakened Kemalist army. The essays posted at the aforementioned site clearly point out the underlying problems of the Greek armed forces: the lack of professionalism of the officer corps, the rigid planning at the operational and strategic level and the lack of support between infantry, artillery and cavalry. A simple economist with an unhealthy interest in military and intelligence history. Copyright © Christos Triantafyllopoulos 2011. Simple theme. Powered by Blogger.